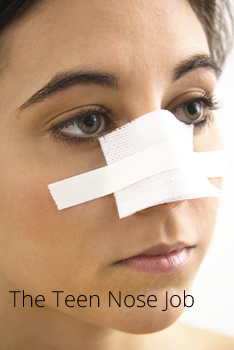 The nose job, or Teenage rhinoplasty, is the most common cosmetic surgery done in teens. As of 2012, the American Society of Plastic Surgery (ASPS) indicated that plastic surgery among the young is on the rise with the number of teenage clients receiving treatments today at more than five times the number it was fifteen years ago. Dr. Michael Bublik, as a board certified physician in Facial Plastic Surgery and Ear, Nose, Throat Surgery, is often consulted by teens and their parents about rhinoplasty. Dr. Bublik understands that along with the insecurities and fears that are so common in adolescence, having a “big nose” can make some teens particularly self-conscious and unhappy about their appearance. Dr. Bublik explains that adolescence brings many physical changes, including changes to a teenager’s face. The adolescent’s sinuses continue to grow which enlarges the face; the jaw (especially for boys) begins to increase in size and the nose changes shape and enlarges along with the face, resulting in what some teens call a "big nose". The nose, specifically the septum (the wall that separates the two sides of the nose) serves as the focal point or center for mid-facial growth. Dr. Bublik is adamant in clarifying that when it comes to “nose jobs”, timing is critical. Prematurely disturbing this growth center could lead to abnormal development of the face. Therefore, it is essential that teens and their parents consult a qualified surgeon such as Dr. Bublik who has the expertise and experience to evaluate the adolescent’s facial growth and determine the appropriate time to consider a rhinoplasty. In general,Dr. Bublik explains, most girls can have a rhinoplasty about one year after their first menstrual period, while the right time for boys can vary more dramatically, although nose surgery can typically be performed successfully by age 16. Parents and teens alike often ask Dr. Bublik how long it takes after surgery to be able to return to normal activities. Dr. Michael Bublik observes that, in average, most teens need to take off about one full week and focus on recuperating and resting after surgery. Most of Dr. Bublik’s patients return to normal physical activity three weeks after surgery, except for contact sports such as wrestling and football that should be avoided for at least 6-8 weeks. Another concern that is often raised by patients and their parents relates to pain. Dr. Bublik likes to reassure his patients that they will not feel anything during surgery, however, he points out that patients are likely to experience some discomfort, but very little pain, right after the surgery, while the patient’s face, particularly around the eyes, may look bruised and swollen for a couple of days. 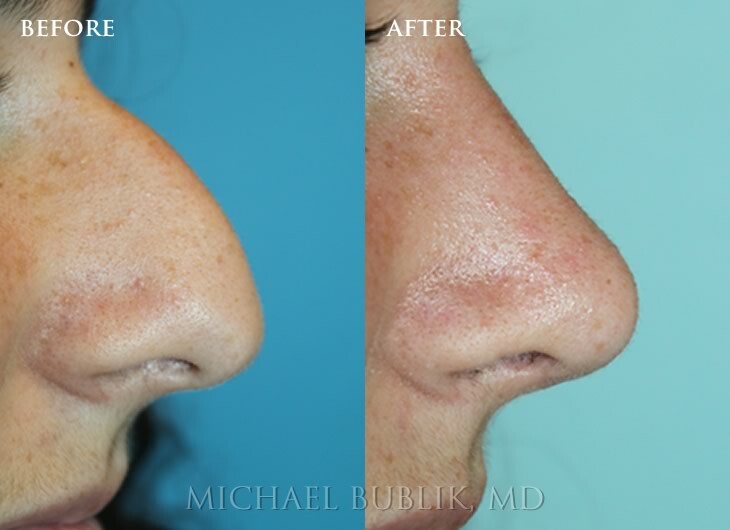 In Dr. Bublik’s experience, any discomfort or pain tends to subside on the second or third day after the rhinoplasty. As a skilled surgeon, it’s important to Dr. Bublik to ensure that the patient’s nose is the right shape and proportion to the patient’s face, so that the adolescent will look better but still look like himself/herself. Dr.Bublik likes to point out good humoredly that, surprisingly, most classmates will not figure out that the teen had a nose job; most people will think the patient had a haircut, and won’t be able to figure out what’s different. Dr. Bublik reassures his young patients that even their close friends, who may know about the surgery, will probably not make a big deal about it as the patient’s new nose will harmoniously blend in with the rest of the teen’s facial features. More importantly, Dr. Bublik points out, the patients are the ones who will notice the difference in their more elegant, less prominent noses, and the resulting feelings of self-confidence and pride in their appearance. As an ethical and conscientious surgeon, Dr. Bublik won’t operate on just anyone who comes to his office. He likes to ensure the timing is right in terms of facial development, and he needs to assess that the decision to have the surgery is the patient’s own decision and not the decision of pushy parents. Also critical to Dr.Bublik is evaluating the teen’s emotional maturity and that the teen has realistic expectations of the surgical outcome. Finally, but equally important, Dr. Bublik considers the patient’s commitment in following pre and post-operative guidelines. In Dr. Bublik’s experience, teens like to take advantage of the summer and winter breaks to undergo surgery, so planning in advance is critical. Call Dr. Bublik’s office today for a free consultation and he will be happy to meet with you to openly discuss all aspects of the surgery and address any questions you may have.